One can learn a lot from the dung beetle. From going back in order to move forward and how to make the best of every situation. 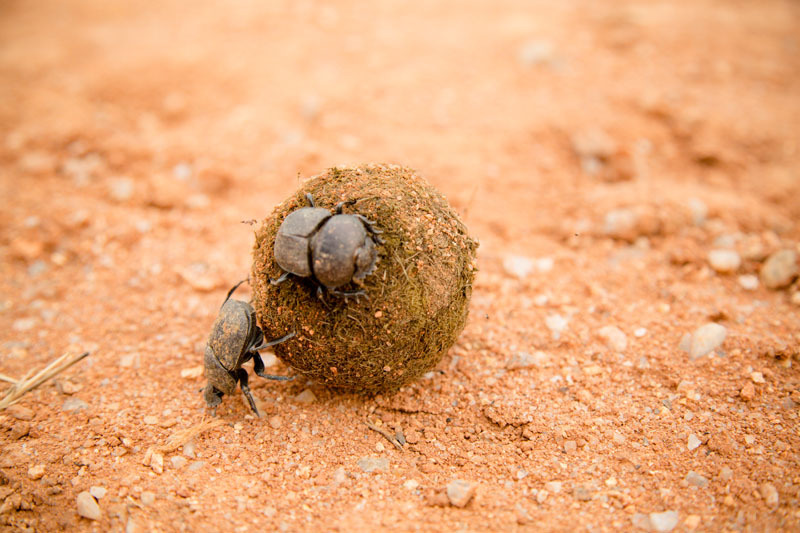 Next time you’re out and about in the Lowveld, take some time to look out for the incredible dung beetle. Dung beetles can be classified into four categories – the rollers, tunnellers, dwellers and the stealers. The rollers roll dung or animal poop into balls that are either used by females to lay their eggs or simply as food. The tunnellers bury the dung whilst the dwellers live in the dung. They do not burrow or roll it at all. The stealers simply steal dung balls from other dung beetles. These insects play a pivotal role in the ecosystem. They fertilise the ground by breaking and burying dung. If it wasn’t for them, plants would not be able to grow as easily. Did you know that the dung beetle can roll and move a ball 50 times their own weight? It is said that the Dung Beetle is the world’s strongest animal and insect when taking into consideration its size and the weight it can move. Besides rolling dung, the male dung beetles display their strength by fighting one another to win the attention of a female. One sub-specie can even pull a dung ball 1 141 times its body weight. This is equivalent to a human pulling six double-decker buses filled with passengers. Why would these insects eat dung? Generally speaking, other animals like cows, rhinos and elephants eat tasty leaves which contains a lot of nutrients that dung beetles require. When these tasty leaves pass through the animals’ digestive system, some parts are undigested in the dung. Adult dung beetles feed off these nutritious bits whilst larvae eat the solid dung. They find fresh dung with their sensitive sense of smell. It is easier for them to find fresh dung. A fresh pile of dung from an elephant for example, can feed up to 16 000 dung beetles. Since they can fly, it is easy to move onto a fresh pile of dung within a couple of minutes. Dung Beetles also use dung to cool off. Since the ground they walk on can get hot, they would climb on top of dung to cool their feet. It is scientifically proven that dung is cool since it contains a lot of moisture. Of the more than 6 000 beetle species found in the world, 800 can be found in South Africa. Dung beetles at Likweti Bushveld Farm Estate.